Ready For Summer Giveaway – 5 Winners! Thank you for entering! The winners have just been notified via email. They are: Maria (partial email koolmom), Jacquelyn (partial email 430), Ann Smith, Arlene Mackel, and Linda (partial email tar heel).Look for more giveaways coming up! It’s time to get ready for summer! Whether you are planning a staycation, visit to relatives, or full on camping trip, I’ve got some fun things to share with you today. I’m giving away a few indispensable items that I just love (you can check them all out here) to get us all excited for the sunny days ahead. This giveaway is going to help you get a head start on summer fun! These are five of my favorite Summer Ready items and there will be one winner for each item. 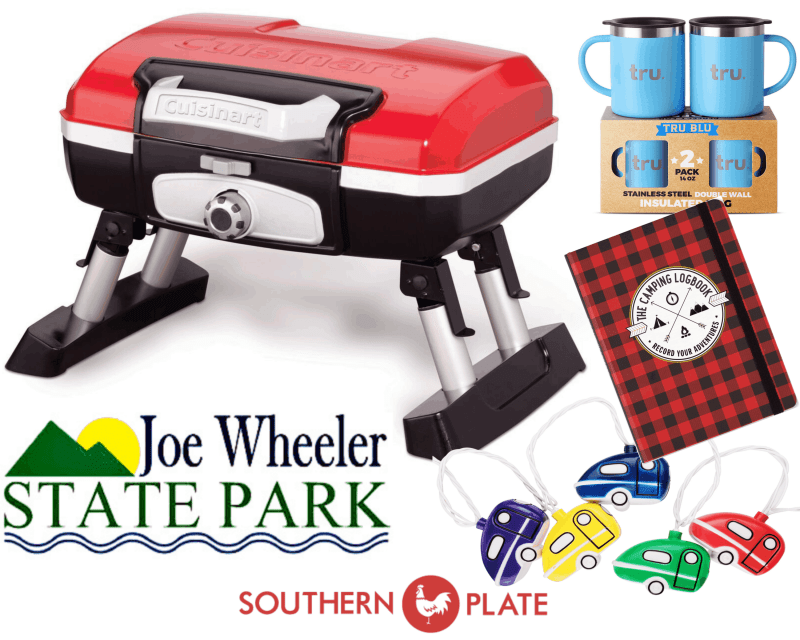 The top two prizes are a Cuisinart Petite Gourmet Tabletop grill and a 3 night stay at the Joe Wheeler State Park campground in Rogersville, Alabama! See my entire list of things I love for camping by clicking here. Entering is easy! Simply leave a comment below! Giveaway closes Monday, April 15. Winners will be contacted and announced April 16. Let me know in the comments if you are within driving distance of Joe Wheeler, otherwise I will just enter you for the other prizes. Winners will be announced on this post April 16, 2019 and contacted by email. Five winners will be chosen at random and awarded prizes in order that they are chosen, using random.org. If any of these prizes are not available at the end of the contest, an Amazon gift card for the value at the time the contest was launched will be given instead, with the exception of the Joe Wheeler Lodge prize. Winner has three days to respond to email or alternate winner will be chosen. Not responsible for emails sent to spam folders so if you enter please check back on this post to see if you won. Such great items for celebrating summer. Thanks for this giveaway! I would love to surprise my husband and daughter with a surprise trip to Joe Wheeler! Every time we drive by she asks if we can go. This would be a great getaway for us, especially since we are within driving distance to Joe Wheeler! Thank you! Love this giveaway! But I’m in Texas! What a fun giveaway! You are the best! Love all of these prizes. Unfortunately not near a Joe Wheeler. My family loves camping and we use a lot of your recipes. It would be great to win any of these gifts but unfortunately I live too far away to enjoy the camping trip! Thanks so much for your Facebook group, love it. I am always up for a road trip! Your give always are always the best!! Love the giveaways you have. We moved from Dallas, Georgia to Texas the end of January. This Alabama girl would love to stay at the lodge. The prize list is wonderful. Love spending time with my family. Thanks Christy for helping me to remember the joy of being a wife, woman, mother, g.ma, and Christian. I don’t have a large friend network, so it is refreshing AND inspiring to read your posts. Love love love your recipes and summer ideas! May the Lord continue to bless and keep you and yours! The recipes sound so delicious, can’t wait to try them. Would love to win in the give away. Thank you for all you do, I deeply appreciate it. Have a happy and blessed day. Greetings from Ohio Christy! Please enter me in the sweepstakes. God Bless! We haven’t had a vacation in years, so this sounds fantastic!! Thank you for the opportunity! We are retired, so pick up and go camping a lot during the week when campgrounds aren’t so busy. JW Park is too far, but love camping. Relaxing vacations! Great Give-Away! Love Joe Wheeler State Park. Thanks for all you do, Christy. I love your site. I’m not close to Joe Wheeler but would love some mugs. Im not close enoughfor Joe Wheeler but the other things are certainly useable! Count me in the drawing please! I’m in Deep South Texas. I enjoy reading your posts. Looking forward to the drawing. This Bama girl would love to win any of these prizes! Thanks Christy! What a great start to camping season. This would be fabulous for summer cooking and camping. I would love to give that grill to my best friend of 38 years. She loves to camp, I do not!! But, those mugs look wonderful! Awesome prizes. Thanks for your great website and giveaways! Greetings from Idaho! Sure would like to win that grill. Fingers are crossed! Happy Summer and thanks for doing this giveaway. We bought our first 5th wheel last year and have fallen in love with camping. This are awesome giveaways. Love our Alabama State Parks! They are all within driving distance and make for great weekend getaways. Please enter me in your contest! I would love to win the grill! Unfortunately, too far away for the camping trip. State parks are so relaxing – larger sites and better views. We are too far from JW Park. Thanks for all you do and for the chance to win! God bless you! Bless your heart!! And how sweet of you!!! Love camping at Joe Wheeler!!! Love your books and recipes too!! I am so ready for summer! I love spending the days my family and being schedule free for a couple of months. Thanks for sharing some of your favorite summer items. How nice of you to give away such cool camping prizes!! JW is our favorite place to camp!! How generous of you to have these great giveaways…would love to take my cousin’s wife on a surprise trip back home so she can visit her new great grandson and her 86 year old Mother that lives in Wetumpka, AL. Thank you for this site. Love your recipes. You are an inspiration to us all !! Kansas is too far away from JW Park, but looking forward to bbq’ing this summer, w/family. Thanks for your scrumptious recipes and God bless !! Not much of a camper these days. I sure lived it when I was younger. But I do live your recipes!!! Thanks for the give away, it’s always fun entering. Really enjoy the recipes! I don’t camp but i would love to grill inside. Never thought about buying one of these. Live in Seattle…don’t think that’s within driving distance! No longer on FB so can’t enjoy your chats. I wish we were closer to Alabama, NH is getting spring snow and I am not happy about it! Bring on the summertime! Woo hoo! It’s a cold, windy day here in PA- but the sun has peeked out now and then- hallelujah! What cute mugs! Actually, I love all of them. Sadly, I’m not close enough for the park, but I know it well from visiting my family in the area back in the day! Love your recipes and your website! Awesome giveaway. I’d really like to start tent camping with my kiddos and the grill would certainly be nice! Thanks for the chance! Sounds fun! We live within driving distance. Sounds like a fun place, however, i am not within driving distance. The other prizes sound amazing. Love your emails and recipes and also love camping! There are many beautiful places to camp, but we are not within driving distance of JW Park. Camping is something for every age from the youngest to the oldest. Love to cook and eat outside! We are not close to Joe Wheeler Park But we love the outdoors and would love to have any of the other prizes! Thank you for sharing your recipes, Bible studies, and just your lives in general! What a wonderful inspiration you are to us all. You share your blessing with us each day. We love camping. Just got back from spring break camping. Thanks!! We are in KY, and I love, love, love your recipes! Nice camping items! PS… I am going to make the macaroons for choir practice this week. Love your posts and blog. This is a great give away. Love your posts! Great recipes and easy to follow. Love the mugs! How exciting. It’s almost time for the summer prize giveaway! I live in Missouri so Joe Wheeler is out for me. BUT….I do love to camp and the rest of the items look super! What an awesome giveaway! Christy you are so very generous! Would really like to get out of town for a night or two. Hello Christy!! I would love to be signed up for the prizes. Unfortunately I don’t live close to campground. Love your camping items. I’m not near the campground. Thank you! Thanks be Christy! Would love to won! That would be great to have. Look forward to your letters. Can’t wait to try the slow cooker angel chicken. I would like to win these great prizes. But I’m not close enough for camping at the state park. My hubs and I are plann7ng a camoing trip this year and we live within driving distance. Would love to go! Haven’t been camping since our kids were little. Awesome giveaway! Our vacations growing up we’re overnight camping trips. Could never go far with cows to milk. Many fond memories. I miss those days. Thanks for the giveaway! I really enjoy your stories and recipes. I definitely will try the potato salad recipe this week. I’m not in driving close driving distance. Yes I live within driving distance! I would love to win any of these great gifts! Thanks! Love your site. Unfortunately JW State Park is a little out of our driving range ability. Would love to win! It would make a fun trip! My kids have never been camping. Thanks for the giveaway. Great recipes on your blog! And love the fact that it’s uplifting and Christ-centered! Would love to camp at JW! We love state park camping – Illinois Kentucky Tennessee Georgia Florida Arkansas! The only Alabama Park we’ve stayed in is Oak Mountain and we’re looking forward to going back there! My wedding was at Joe Wheeler! We love to drive through and see the deer ! What a neat give away! We are Not in driving distance of the lodge. Look forward to winning one of the other prizes, especially the grill! Thank you for having this Summer Time Giveaway! Thank you for the opportunity to enter this enjoyable SummerTime Giveaway. Thank you for the possibility to win in this SummerTime Giveaway!! 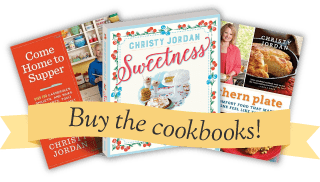 I love Southern plate, not only for the Recipes but also for the Stories(“History of your family and friends family that goes along with the Recipes. I also love Southern Plate for the Encouragement and for the Bible Study that goes along with it. I would like to win this for my son whose given 11 years of his life taking care of me and still doing so. Thank you for doing this. God bless. I’m in Birmingham area so I can drive to Joe Wheeler. Thank you for the opportunity. Would love to win! I LOVE camping. We try to go at least once a month. I LOVE your site. Thank you so much for the give away. I always enjoy your recipes And your good sense of humor. Would love to win this prize pack and to use them while camping at Joe Wheeler Park! I would love to win, my BD is April 28. I have wanted a Lemon pie like that for a very long time. Thank you so much. I have signed up for your email recipes, I would love one of your cookbooks. I am also going to try the Chocolate chess pie, looks delicious. Great giveaway! I live a couple of hours from you and Joe Wheeler. Came for Easter recipes and found a giveaway! I love your old & new posts, like the Easter cooking timeline, especially. I begin taking over the chief cooking duties this year as my mom needs to step down and become MY assistant. Thanks for everything. Hello Christy, how very thoughtful of you to think of others. Love your recipes. I’m unfortunately not near the park since I live in Texas. I would love to win any of the other great prizes though Thanks so much for the chance Christy! Great prizes! Unfortunately, im not in driving distance of the campground. Thank you! I’d love to win a trip camping and all this cool camping stuff!!! Goodness we all are so anxious about summer coming! Thanks for the giveaway! Blessings one and all! Thank you for a chance to win your summer giveaway. I enjoy your site and have enjoyed many of the delicious recipes. Thanks! Thank you for letting have this chance. Love your recipes. I have been wanting to camp somewhere different. I would like to try Joe Wheeler! It’s too far for me to pull my camper but I would love to stay in the cabin! Thanks for your uplifting posts. What a fun giveaway – good luck everyone! What a way to get in the summer mood! Thank you again Christy for the opportunity to win these great prizes! I couldn’t win the State Park trip since I’m in Texas but the rest of them would be amazing! What a fun giveaway!! I’m in KY, so not driving distance. Too far fron Joe Wheeler, but have camped in Canada, N. Y., Kansas, Missouri , but mostly in Ohio. Best way to travel. Would much rather stay in an RV than a motel ! I have been hoping to take my family to Joe Wheeler park for some time now. We live about 2 to 3 hours away in central Alabama. I would love the whole package!! I love your recipes. Especially the strawberry pie recipe from way back. I’m in Brooklyn on personal business and hubs is in TX so we wouldn’t be able to hook up for the camping trip; but we would LOVE Amazon gift cards or any gift you might offer except for camping supplies. Yippee! We love to go to our deer camp. These prizes would be great to have. Road trip for sure . Also great time to visit some friends in AL . Joe Wheeler is a beautiful place close to home. I love that your giveaway highlights our little neck of the woods! Love your recipes and all your talks with us, Christy!!! Thanks for the chance to win things!! You are the best!! These are really nice items for summer. I hope that I win….but I don’t it’s still ok with me. By the way….I love your website. I do live near Joe Wheeler State Park, it’s a beautiful place. Your give aways and recipes alike are wonderful. Thanks for always thinking of your followers! I have my hanging hammock with mosquito netting, so all that’s needed are these goodies (fingers crossed for me to win). I thoroughly enjoyed the “Sacred” article. I came for the watermelon, and left with so much more! God has blessed you with an ability to write such insightful, thought-provoking words, which should reasonate with many readers. God bless you, and thank you!! Thank you for having this great give away. I would enjoy and of the gifts! We’re moving to KS from GA as soon as the house sells! Meanwhile, we sold our grill and are really missing having one! Winning the grill would be AWESOME! AND…your cookbook is ready asked and already in KS!! We are Living streamlined! Just waiting for God to send the family who is going to love our home as much as we do! Have a joyous day!!! I love Joe Wheeler Park. (sigh) But now I’m 650 miles away. I make a trip back each year and would love to spend a night in the lodge when I do. That would be awesome. Thank you Christy. This would be great. Thanks for a chance in this giveaway. A couple of days of rest and relaxation would be so nice! Never been to Joe Wheeler state park. I have some family members that live in that area that we haven’t seen in awhile. This would give us a chance to see them too! Thanks Christy for the awesome opportunity! Love your recipes, camping & cooking out. Too far to drive to the campsite! I’m new to the site. So far I’m loving the recipes and can’t wait to try. Would love to go camping. Made quit a few of your recipes, there easy to follow and love all your cute directions when you happen to make an error would love to enter your contest I finally have my deck on for BBQ ing once spring is here!!! Hello and thank you for this fun filled giveaway. I live in Georgia. Love you recipes that you post but love more that you are a child of God!! Happy Easter!!! He has RISEN!!! We would definitely go to a park and enjoy a wonderful dinner out in the fresh air. Firing up the grill, cooking Hot Dogs, Burger’s with our Grand daughter and her 2 boys, our Great Grand Children. Oh! that would make one awesome day being with all of them for a day. Thank you for doing this for all of us. What a perfect grill for camping! Those mugs, especially, would be a great addition to camping gear! Great way to start off summer! I would to win any of these items!!! Be useful at the pool!!! We bought up a little pop up camper last summer and we’re looking forward to some adventures this summer. Would love to try out these things! We’re in MS – definitely in driving distance! Fun camping prizes, Christy! I would love to be entered for these great prizes, I’m in TN so you can leave me off the drawing for the stay. Thanks so much for the giveaway! That grill would be perfect on my tiny patio in my tiny garden home. Pick me! Pick me! I love everything camping. Pick me please. I am too far to go to the park and I would love to win the other prizes! Oh this sounds so great! Love to camp!!!! Love your recipes and giveaways! Too far away for trip to Joe Wheeler but would love the grill to take to the beach next month! Thank you for this give away its so kind. I love reading your stories about each recipe. I especially enjoyed your story behind your challah recipe. This is a very kind give away. Love the grill! Looking forward to Summer, in Washington State! The camping prize would be fine since we are fulltime RVers. I would prefer an Amazon gift card instead of the lights or log book. Thanks for hosting the giveaway! We do not live near a Joe Wheeler, but we love being outdoors so the rest wouldbe great! I would love a grill for tail gaiting.. Great giveaway! We are not in driving distance Christy and with our disabling conditions all three of us, we would like to enter the contest please. Thank you Christy for posting the Give away and all your amazing wonderful Recipies they remind me of my grandma and great grandma’s cooking mama’s too. Down home on the farm to table clean best eating all around. This is a great giveaway! I am looking forward to summer. I would love to drive to Joe Wheeler State Park for a 2 night stay. What a great giveaway!! I am so ready for warmer weather. I would love to have this for our RV!!! I love it! Cool stuff!!! I am enjoying many if your post and recipes. You must be a great cook, all the ones I have tried so far are really good.Thank you. First time seeing this cute grill. Perfect for camping, picnics, and tailgating. That grill would look nice on our picnic table near our camper. Love your recipes and wise words and would love a girls trip to Joe Wheeler (or any of the other prizes). This will be fun! Who doesn’t love a giveaway? Rock on Christy Jordan! I’m still laughing about the Operation game! Lol….lol….lol…. Love it, no RV but travel a lot so would have fun with this. I love camping too! We have had our rv for 2 yrs now. It’s so fun and relaxing. These seem like great gifts. Alabama wouldn’t be in driving distance. Thank you very much for the opportunity to enter this contest. I do not live near Joe Wheeler Campground, but I can certainly make use of the tabletop Grill and the mugs. Sincerely stated, Marilyn G.
WOW! Nice! We are not within driving distance of the campground. But love the giveaway. I’m a life long camper and can’t wait to get back to the lake to camp again! I wish Joe Wheeler was within driving distance. We love to try new places. We love camping and within a short distance of Joe Wheeler! We would love to win this! Wish I was closer to Joe Wheeler Park but I’m in Texas. I would love to win any of the other prizes though Have a great weekend Christy and many thanks! Love this! We aren’t within driving distance of Joe Wheeler, but would love to be entered for the rest! Would be great, thank you! Ohhh, my, love this ! We can make the drive to Joe Wheeler . Thanks for the chance. Christy I looked at the map whew! It would take us for sure 2 days due to our physical conditions but what an Amazing place I just signed up for the information on all the parks throughout the state they are Beautiful indeed. The products giveaway is amazing I could pass on the blessing to my family or our minister as I know they could use a get away after the Medical journey with their sweet daughter. Thank you very much Christy for being a blessing to Everyone that subscribes and also everyone that is on Facebook Twitter on front porch fellowship you created. Praying and praising God, Jesus all the while while cooking and reading your beautiful posts and Women’s Bible Study I just really enjoy all that you do and I know so many of us that subscribe as well. Happy Cooking and our son, he has Autism our Very sensitive picky eater, as he says, ” no green stuff or fruits” so my husband and I get very creative on what our son sees, hears, tastes, as we can get by with some things. When our home burned down August 1, 2017 my bday and me with the flu, (our son goes to N. Fla. Rotary youth camp every summer), he brought home the flu. Well we lost all of all brand new cooking pots pans and All the camping gear, all the handed down by generations cook books, containers, written old family Recipies, and those good old fashioned handed down appliances and some brand new. The rental did not have a fire alarm, our pup barked us up. Big story there it was electrical. Your Recipies remind me of my all my family cooking some from generations ago, and my late mama and grandma cooking mama passed away in June last year unexpected, grandma ( Gamama) just recently and grandma a few years ago. What a wonderful giveaway!! We live an hour from Joe Wheeler State Park. Would love to be one of the winners. That is Wonderful As Diedre! it looks beautiful there what a blessing to have all the parks so close. Love your posts! This contest is wonderful. I love to camp. But am no where near Joe Wheeler. I love asparagus but never have tried it roasted. I will be doing so as soon as I get some from the store. It’s one of my favorite vegetables. Hi Christy!! I wish I was in driving distanice to Joe Rivers State Park, but I’m not! I’m happy for everyone who is though! I ‘d love to be entered for the other prize! Thank you! Great giveaway! Thank you so much. You’re such a blessing! Would love to win! We are within driving distance of the campground. What a great giveaway! Would really enjoy that grill. Will love to win this I live close to Joe Wheeler State Park. It’s always great to have Christian friends. I NEED a get-away and this sounds great! Would love to drive over to our neighbor state! But it’ll be in a car 🙂 No RV. It’s chilly here today still – ready to welcome summer! You have such nice give-aways. Love the mugs but the Table Top Grill would be so nice. Being in our 80s, how convenient would it be to grill for the two of us in our domain. But this follows your wonderful recipes and biblical scriptures/remarks. Have a wonderful Easter and God Bless you and yours. Always up for a road trip!! Great giveaway. The table top grill is pretty epic! You have great recipies and your give – a – way drawings are always nice. Those items will make summer more fun. Give aways are such fun. Just thinking about winning starts the summer out. I am not within driving distance. My 4 young kids love to go camping! We don’t live within driving distance of Joe Wheeler but we do support the county and state parks where we live! We live for adventurers outdoors! What a great giveaway!! Thanks so much for a chance to win!! Not able to camp now but when I was younger, my husband & I camped a lot. As I’ve gotten older, a daylong “picnic” in the mountains, to watch the sunrise, explore & then watch the sunset is what I like to do with an overnight stay somewhere with a BED! Christy, I’m so excited for everyone!!! Love it all I am ready for camping to begin! What a great giveaway! We would love to win. We want that grill – we need that grill!!! Wonderful prizes! I’m in Nashville. However, it would be a nice getaway trip in the lodge. Can’t wait for the giveaway winners to be announced. Would love a night at JW or any of the other prizes!!! Thank you, Christy! What a lovely giveaway!